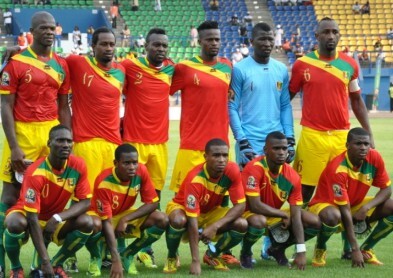 Guinea made it to the round of 16 in the most fortunate circumstances, though maybe it’s luck they do indeed deserve. After being tied with Mali on all fronts after all Group D fixtures had been played they “won” a drawing of lots to be the team that would go on to face Ghana in the next round. Michel Dussuyer’s side had to play all home qualifying games for this tournament in the Moroccan city of Casablanca, due to the Ebola pandemic. For a side to qualify when they played all matches virtually away from home is a testament to their mental strength as they had to give up all the advantages of a home crowd as well as deal with what was going on back home. Dussuyer’s team will be well accustomed to the footballing challenges they will face today, having already played Ghana twice in qualifying. They drew to the Black Stars 1-1 in Casablanca before losing the return fixture 3-1 in Tamale. Just as they did on those match days, they will most likely set up in a 4-1-4-1 formation and look to break quickly through the flanks, especially through Borussia Monchengladbach’s Ibrahima Traore. It’s on the other side of the pitch where the Guineans may get a bit of joy. Ghana’s right fullback Harrison Afful is often caught too high up the pitch, leaving space behind him to attack. With the Black Stars unlikely to utilise a true anchoring midfielder Seydouba Soumah should be able to exploit this weakness. Ghana managed to top the group while not looking particularly impressive, in a manner which is now becoming the norm for them. They managed to beat Guinea at home while also looking average and although they won’t have the home advantage this time it’s difficult to not see them doing it again this time around. Although this is a less than stellar collection of Black stars they still possess more quality than their opponents while having a good amount of experience. For example, Andre Ayew is only 25 but seems to have been around for ever. Avram Grant will most likely pick the same side that came back from a goal down to beat South Africa 2-1 although they may actually face more problems in Malabo today. Guinea have a fairly structured midfield but Ghana are quite the opposite. They have an attacking midfielder, Mubarak Wakaso, placed alongside a box-to-box one, Afriyie Acquah and it’s not a rare sight to see them so far apart and Ghana open to a fast counter attack. In fact the midfield pairing hardly play as a partnership and barely pass the ball to each other. If Guinea can clog the space up in the middle of the park well they could leave the Black Stars looking rather disjointed. However, Ghana have looked disjointed since the days of the great Serb Goran Stevanovic and still somehow always manage to sneak their way into the semi-final so we have no reason to suspect anything will happen to the contrary.